On the shores of one of the lakes around Srinagar, the quiet gathering assembled under the shadows of a mighty Chinar, does not give away much of the energy that it has hidden under posh clothing, and intelligent gazes. The artist is selecting tracks, behind his carefully arranged table that consoles the huge BFR sound system, hand built in symbolism, of moving away from capitalist technological dependance that artists and labels around the world find difficult to negotiate with. “This is a hand-made Jamaican style sound system, that we have built ourselves, with a lot of help from our friends. It’s specially designed so that reggae music can be experienced the way that it is meant to be, as a physical sensation in the body, and not just the ears,” says Taru Dalmia. Taru AKA Delhi Sultanate, is part of The Ska Vengers, a reggae resistance group dropping ska beats across the sub continent, along with Samara Chopra AKA Begum X. In Kashmir as part of BFR Sound systems, Taru and Samara, do not shy away from playing and holding the musical fortress, from tribal rights of the deep green resistance in India, to antifascist movements building across Indian Universities, to caste and class oppression, as the corporate-state nexus casts shadows over everything else in India. 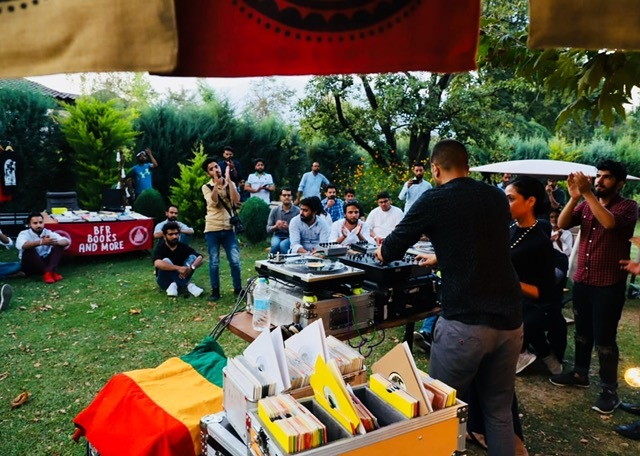 For now, the group is in Kashmir, along with Azadi Records, a label that in Taru’s words, looks to have conversations and connect with the local art and music scene here. Azadi Records is releasing an EP by Kashmiri rapper Ahmer. The collaborative effort to organise an event for the hip hop community in Kashmir took a setback when the event scheduled at a public park was canceled due to the tense situation. Seated in the lawns of an art retreat home instead, from poets and designers, to singers and composers, the gathering is a mix of art, and Kashmir’s signature resistance. Kashmiri artist Ali Saffudin walks in and puts on his guitar as Samara Chopra sits in the front, in a powerful pose. A circle gathers around. Saffudin goes on to sing his version of Faiz in a way that helps the audience make sense of the words in todays time. Being sung in a different place, for a different set-up, Saffudin’s rendition attempts to make the politics and violence around him into symphonies that are not tangible, but are felt. “This one I wrote the morning we got to know that they have hung Afzal Guru,” he goes on to say as he plays another track that challenges and criticises the powers that be, in an ‘utter refusal to be subservient’. The gathering talks about free speech, the freedom of though, and faith. As Taru along with Samara goes on to play another track, with neighbours peeping though the windows, the duo finds it difficult to make the people move to the vibrations that the BFR sound system can churn out. It will take the Delhi Sultanate a few more trips to understand that the Kashmiri society is so deeply traumatised owing to the violence unleashed by the state on it for waging a war and demanding their right to self determination which the state has denied till date, that the people here cannot enjoy or celebrate without a sense of guilt associated with it. A Kashmiri hardly ever lets go, or celebrates without thinking, ‘log marr rahe hain’. The positivity of self healing is confused with the positivity used by the state to cloak ugliness, often deliberately, to blur the distinction between the two, to push the population into a perpetual state of mourning. And it might take the group some more time, and a lot of interaction, to hit the nerve. Making a clear distinction, “as in Kashmir, in India too…” Taru introduces Prabhdeep, a rapper from New Delhi, whose family was a victim of the 1984 Anti Sikh pogrom and lives in a ghetto in West Delhi that has seen a spike in drug abuse and gang violence. “InshaAllah… Charhdi kala,” sings Prabhdeep as a ‘mark of solidarity amongst oppressed communities’ in an attempt to find commonalities that is a ‘rare ray of hope’. Be it protest poetry by Syed Zeeshan Jaipuri, or dissent music by Illsane, MC Musaib, Rishabh (RAINO), SXR Music, and Ahmer, the small gathering touches upon many concepts, and thoughts, and talks about the contemporaries across the region. “From MC Kash to Ali here, this kind of music is very inspiring,” Taru says adding “and there is a hope that this wont be corrupted, like what has happened with Bollywood.” Ironically the same was said about popular hip hop artist MC Kash by pop artist Badshah at a corporate event by Radio Mirchi, less than a month ago. While reggae itself has ‘used culture effectively against colonial powers’, art and music collaboration in a place where the word itself means to sell out, will be a tough road for artists and musicians to tread on, while maintaining their originality and clarity, or abstraction of purpose. As art and freedom of thought pass through a crucial stage in Kashmir, it also is sitting at an important cross road. How it manages to sustain, without giving in to the pressures of commercialisation, only time will tell, but the symbolism of the BFR sound system might have some clues, if not the complete answer.